Deadwood 10th anniversary video essay from Matt Zoller Seitz: Look back on David Milch’s HBO epic with this great new documentary. 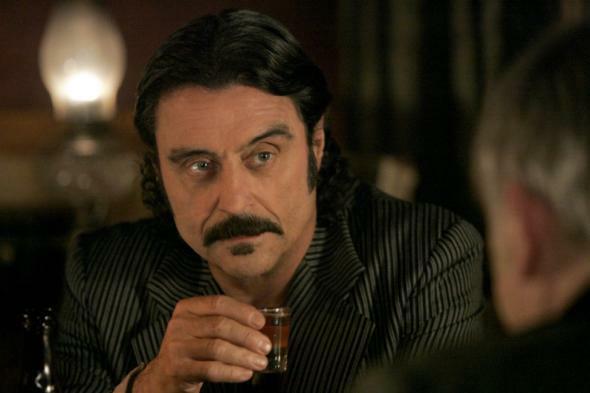 Ian McShane stars in Deadwood. © 2004 HBO. All rights reserved. Certain TV shows arouse a love in their audience so strong it can last for years after they’re over. Deadwood is a case in point. Created by David Milch for HBO, the Western lasted just three seasons before it was taken away from us, too soon, in 2006. But its shocking portrait of vice on the American frontier lingers in the mind more powerfully than many shows that ran for twice as many episodes. Matt Zoller Seitz, New York magazine’s TV critic, certainly agrees: “I never miss an opportunity to work Deadwood into the conversation, as a legitimate point of comparison with other shows or films or because I just love talking about it,” he writes. Seitz has left a trail of Deadwood tributes across the internet; he now marks its 10-year anniversary with a thrilling documentary narrated by Jim Beaver (who played Ellsworth on the show), from RogerEbert.com and HitFix. It’s not new Deadwood—that tantalizing idea has been shot down by Milch after years of persistent rumors. But the 25-minute video essay is a welcome walk back down the sweltering back alley of the show, where everyone’s addicted, drunk, and packing a revolver. Never Watched Deadwood? Try This Episode. You’ll Be Hooked.